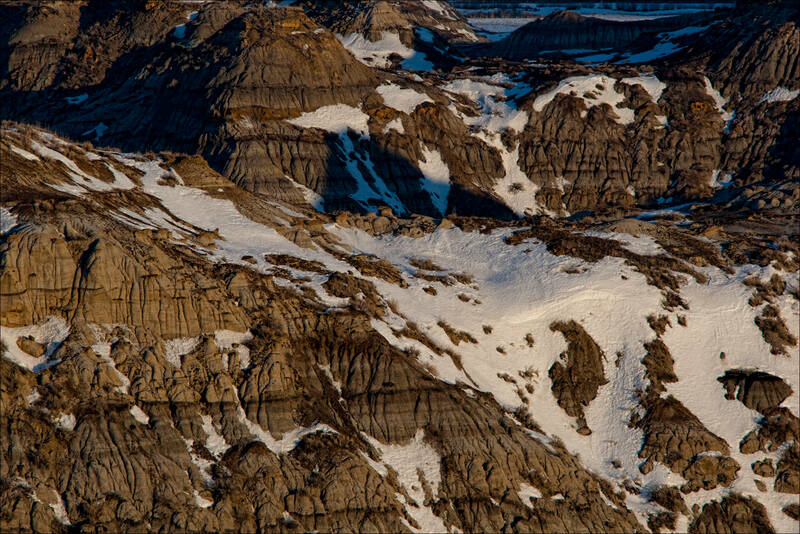 We were in the town of Drumheller on the weekend to explore the badlands and visit the Royal Tyrrell Museum. 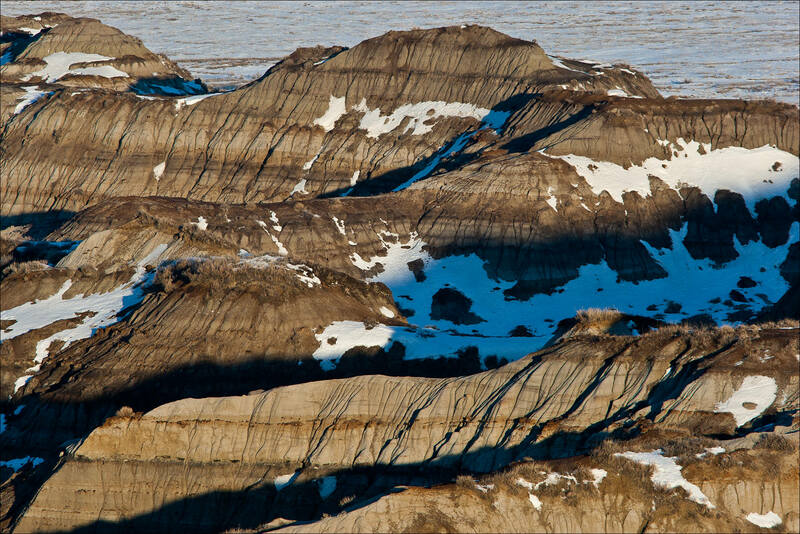 Drumheller is in the heart of one of the world’s most productive sites for recovering fossils and the museum is singularly focused on the science of paleontology. The kids (and the parents and grandparents) had a great time touring the displays, large and small, and I will post an entry from that chaos soon. The exploration will have to wait until the next trip as it was too cold to head out hiking on the trails with the wee’uns. I did sneak out (well I actually woke up my daughter before I got out of the room and my son was awake shortly after) on Monday for an early morning photo session along the Dinosaur Trail which rises out of the valley and then winds along the edge of the badlands providing a number of great viewing spots as it loops back to town. I had two places in mind, one on the west side of the canyon valley and one on the east. I thought that if there were good clouds visible towards the east in the predawn, I would go to the west spot and face towards the sun to hopefully catch the colors bouncing down off of the clouds into the hoodoos and other formations. When I got outside, there were no clouds building out towards the sunrise so I went to the eastern spot so that the sun would be behind me and I could catch the “almost” full moon over the Dinosaur Valley (the name given to this stretch of the Red Deer River Valley) first and then the first light cresting the plains and hitting the peaks in the canyon. 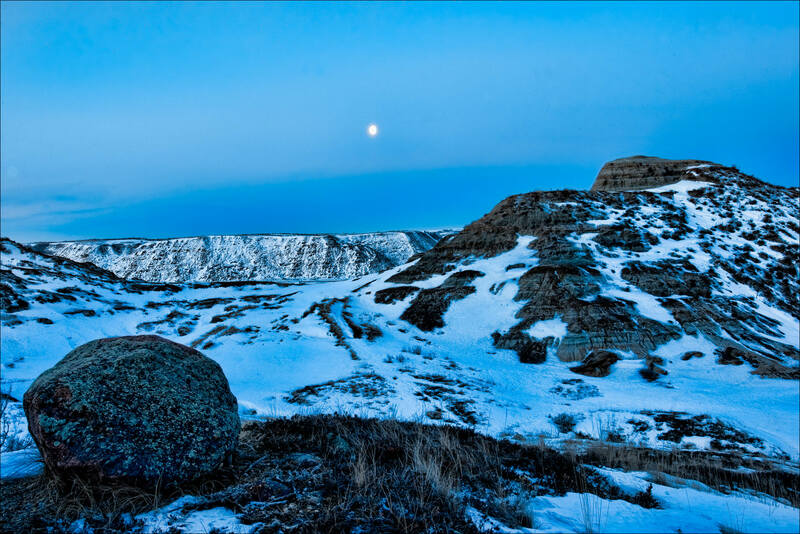 The eastern spot was Horse Thief Canyon. I had a memory of it from when my parents took me there about 25 years ago and thought it would be good raw material to make some photographs out of regardless of what came into the sky. Plus, it has a great history behind it and it was fun to imagine the original brigands ferrying their stolen horses into the winding canyon to hideout before taking them to sellers waiting. 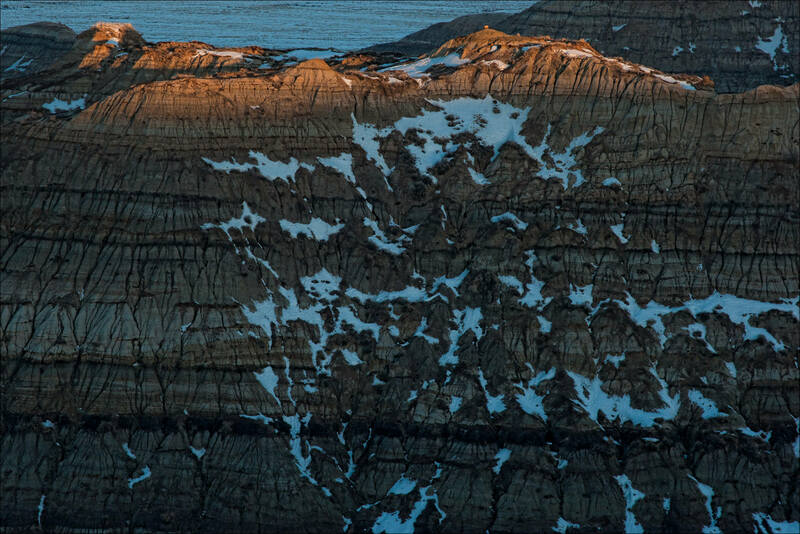 Once the sun came up, I really liked the detail in the faces of the rock walls and cliff faces in the canyon. That absorbed the rest of the morning before I noticed that my fingers were numb and it was probably time to get back, warm up and rejoin the family (the irony that it was family day here in Alberta and I had spent the morning away on my own was not lost on me out on the ridge). In the summer, bright yellow canola fields surround this valley adding another dimension to the scene. I’m looking forward to getting back in the summer to hike and to see another side to this special place. This entry was posted on February 22, 2011 by Christopher Martin. 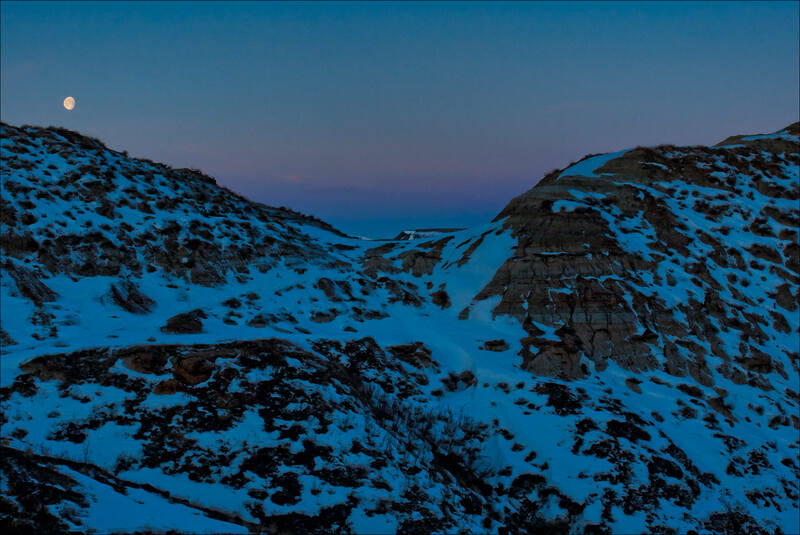 It was filed under Landscapes, Nature, Outdoors, Prairie, Winter and was tagged with alberta, badlands, Canada, canyon, Dinosaur Valley, Drumheller, Horse Thief Canyon, landscapes, moonset, morning, photography, prairie, Red Deer River Valley, rocks, snow, valley, winter. Beautiful shots as usual Vegi-Burger!! “Frozen Desert” is what they make me think of. Being down under and seeing these makes me remember home. I haven’t been to the Drum since i was a teenager! I look forward to what’s next, peace, Ryski.